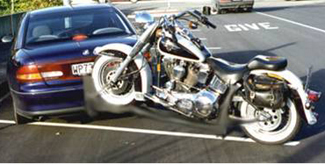 Over the years, many other hitches have been developed and manufactured, but none have been successful in securing the motorcycle in a vertically stable (upright position) during driving. Many competitor’s hitches hold the front wheel of the motorcycle in a fixed forward position, when you turn or corner the bike leans over and this can put dangerous extreme stresses on the front end and steering head of the M/C especially in hard turns and roundabouts, etc. 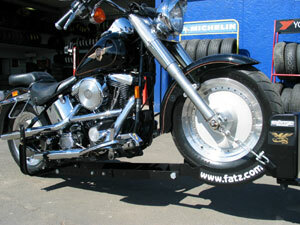 Using the FATZ hitch eliminates these stresses, your motorcycle is held upright and stable throughout the driving process, steering is achieved by the FATZ patented vertical stabilising system incorporated in our bracket. Special features include a ramp for easy loading; designed pivot-points built into the hitch, which eliminates stress, simplicity and ease of use. 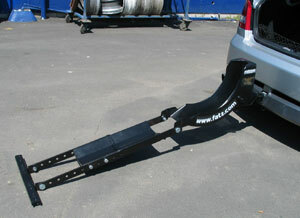 The hitch functions superbly ensuring the absolute safety of your motorcycle during the trailing procedure and when not in use can be folded and stored in the trunk. 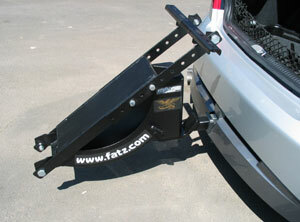 The Fatz Tow Bracket keeps your HD upright and stable even under hard cornering maneuvers due to the Fatz patented vertical stabilizing system incorporated in our hitch with no stresses to the steering head. 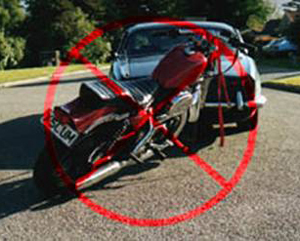 Competitor’s hitch: During a tight turn Note the angle of the motorcycle; this results in severe and dangerous loads on the front end and steering head of the motorcycle which it is not designed to take. Infact we twisted the forks in this test of a competitors bracket. 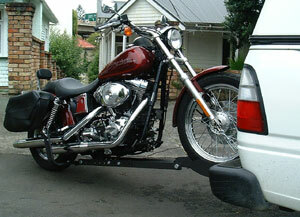 Easy to load and unload your motorcycle. Average time to load and unload is 10 minutes. 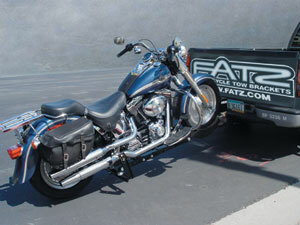 Motorcycle is held upright and stable throughout the total trailing procedure. 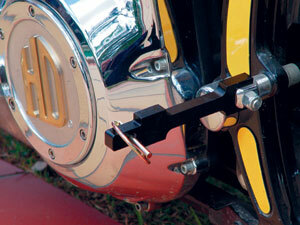 The unique design enables your motorcycle to be held vertically upright even while cornering. 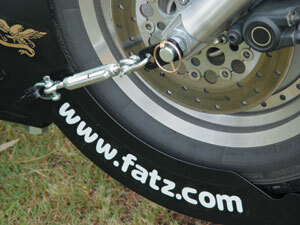 Patented design (vertical stabilizing system) eliminates dangerous stresses to your motorcycle enabling safe hauling especially during tight corners or sharp bends. 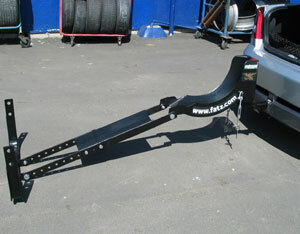 Very easy to reverse your vehicle when mounted. We are not able to fit any of the Springer range at this stage but are working on a solution for them. 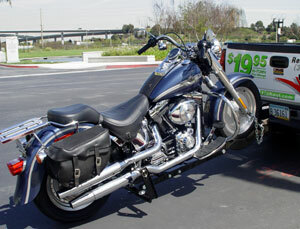 Motorcycle remains upright and stable throughout the whole driving procedure due to the unique vertical stabilizing system incorporated in our hitch. 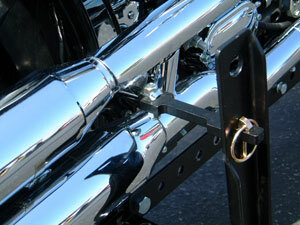 The unique design eliminates dangerous stresses to your motorcycle when hauling.